Cook the Bolognese ragu first. 1. Place a large saucepan over medium heat, and melt the butter in the oil. Add the onion, carrot, celery, and garlic with a good pinch of salt, and sauté for five minutes, stirring often. Increase the heat to high, and add the meat and pancetta a third at a time, stirring and breaking lumps with a spoon between each addition. Adding the meat gradually allows the water to evaporate — which is key if you want to brown your meat and not boil it (this whole process will take 15 to 20 minutes). Turn heat down to medium, and cook for about 15 minutes, letting the meat get thoroughly brown (don’t worry about crispy bits in the pan), but not burnt. 2. Pour the white wine into the sauce pan. With a wooden spoon, scrape all the brown bits stuck to the bottom of your pan. Push the meat all around to make sure you scrape it all off. Cook for two to three minutes to let the alcohol cook off. Add milk, diced tomatoes (with liquid), one teaspoon salt, and a good grind of pepper. Bring to a boil, and then lower to the lowest heat. Let simmer very slowly, half-covered, for two hours, stirring from time to time. In the end, the sauce should be more oil- than water-based and thick like oatmeal. Season to taste. 3. When ready to serve, mix in the butter, freshly grated Parmesan, and about a half cup of pasta water (or some hot water). Set aside for assembling lasagna. 4. Bring the milk and everything else except for the butter, flour, and Parmesan to a simmer. 5. In a separate sauce pan, melt the butter, and add the flour. Stir until doughy and smelling a bit nutty (about one minute). Strain in the milk about a half cup at a time, whisking to incorporate with the butter and flour mix. It should be smooth and velvety, not chunky or too thick. If it is, just add some more milk to thin it out. 6. Preheat the oven to 425°F. Place the tomatoes face up across two baking sheets. Drizzle with olive oil, and sprinkle with salt, pepper, and two tablespoons of thyme. Roast for 30 minutes, turn in the pan, and then roast for another 30 minutes. 7. Turn the oven to 375°F. 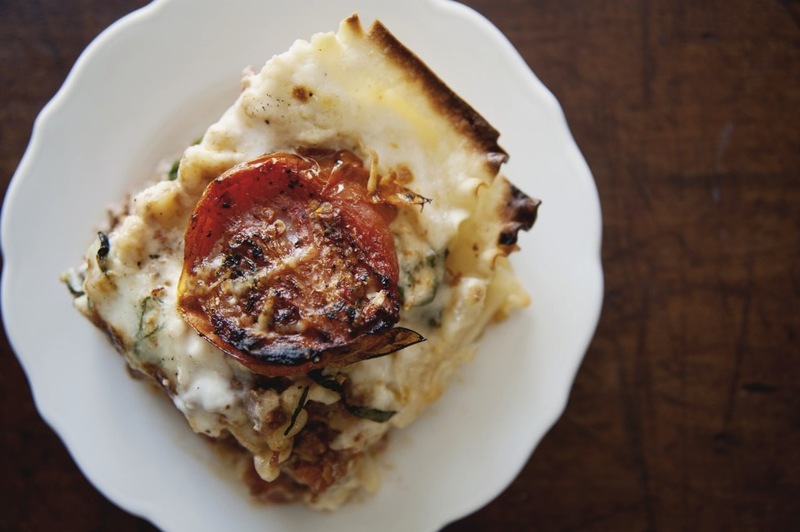 In a Pyrex dish, place a layer of noodles, a ladle of ragu, a ladle of Béchamel, a third of burrata, and a layer of herb-roasted tomatoes. Add the basil, and cover with a quarter of the Béchamel. Repeat three times, and finish with the remaining Béchamel and grated Parm. 8. Bake for 25 minutes or until bubbling. Turn the broiler on, and bake for another five minutes or until brown and crunchy on top. Allow to sit for 20 minutes. Enjoy! Claire Thomas is the creator behind The Kitchy Kitchen, a drool-inducing food blog and soon to be cookbook. Aside from photographing and sharing her delicious kitchen creations, Claire dishes out cooking tips on her YouTube channel 10 Second Living. And she doesn't stop there... Claire has hosted two seasons of the ABC series Food for Thought and has directed and styled commercials for some of the nation's top food brands. This red is bursting with black cherry flavors and a dusting of cocoa.